First solo album from the acid folk singer Frederick. Frederick is based in Toulouse, the capital of the ancient Occitanian region of France. 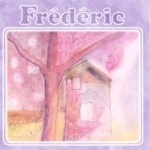 This CD compiles the home-recordings that Frederick released as an ultra-limited double CDR on his own label, Maison Drole Production. (The original included one disk of songs in French and one in English). His songs, influenced by Occitanian traditional music, feel very different from acid folk from the English-speaking world. They have a unique sense of atmosphere, that perhaps come closer to “acid chanson” or “acid ballads”. Edition of 200.